The orange day lily (Hemerocallis fulva) is an old-fashioned perennial that isn’t sold much any more. It is very long-lived… often a few clumps of these lilies are all that remain to show where an old house used to be. Naturalized from the gardens of the early settlers, these lilies are a common sight in this area as they grow wild along roadsides and stone walls. The flowers are large (about 3 1/2 inches across) and showy and last for only one day, but because there is a succession of blooms, the flowering period for this lily lasts about one month starting in late June. Each flower has three petals and three sepals (called tepals) with rolled edges. The inner tepals are broader than the outer tepals and the flowers are held erect or semi-horizontally, instead of hanging down. According to my reference books, because the orange day lily is a sterile hybrid, the seeds in the seed pods it produces are infertile and will not produce new plants. 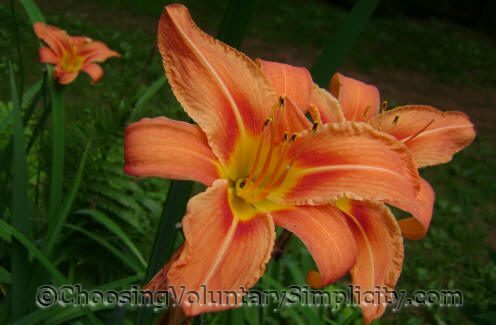 Orange day lilies are very easy to grow and over time will spread to form a large clump that will crowd out other plants. The tuberous roots are hard to remove completely, and sometimes when the plant has been dug up, bits of the root will remain and continue to produce new plants. 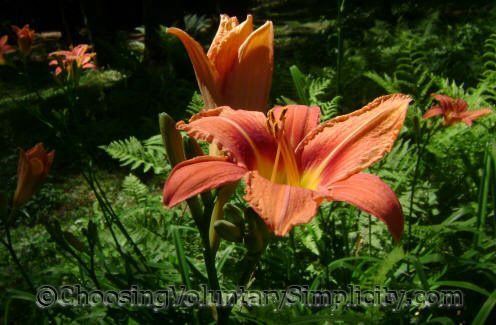 Orange day lilies prefer full or partial sun and loamy soil but will grow and thrive almost anywhere. I have them growing along a picket fence where they make a beautiful block of color each summer. Enjoyed your article about orange daylilies. My late Momma had them planted at the base of a large pine tree and they never grew much. I moved them to my home and set them out in a less shaded area and they have tripled in size already. I don’t care if they are considered old fashioned – – I love old things: Old houses, old people, old furniture, old plants. Along my driveway in poor soil we placed about twenty small day lily plants given to us by a neighbor. After several years they are spectacular. We noticed that after they bloomed many primrose plants shot up to over six feet. We like the yellow primrose flowers and they are visited by goldfinches. But they seem to have crowded out the lily plants, whose leaves are small and many leaves dead. Is there some sort of competition? Will our lilies come back next spring? Should we cut down the primroses? Thanks for your advice. Don, I am not familiar with yellow primroses that grow to that height. Any primroses I have are less than a few inches tall. But… it sounds like your lilies are being crowded out by the yellow flowered plants. My lilies have never died off during the summer, so I don’t think this is a natural thing and is a sign that the lilies are not thriving. Would it be possible to move the plants with the yellow flowers or move the lilies so each plant would have a chance to thrive? this year and the ground next? Or should we get them back inthere ground? Katherine, I really don’t know anything about container gardening because I have never grown perennials in containers. I can tell you that a large perennial like the orange day lily will do better in the ground (long-term), but I think the problem in planting the day lilies in the deck planters would be your winter temperatures. If you had a garage or place you could move the planters to during winter, the lilies would undoubtedly survive until you could plant them in the ground another year, but I have no personal experience to back that up. 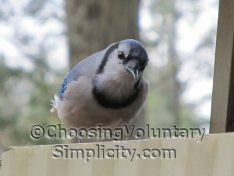 You could ask someone at your local nursery or garden center… they should be able to give you better information. I’m sorry I can’t be of more help. Good luck with your lilies! They’re really a beautiful flower. Did you know that the flower of the day lily can be eaten and is delicious? I didn’t until the weekend when I went on a Forest Gardening course. Next time you are outside, take a flower head, make sure there are no insects in there and pop it all in your mouth. You’ll be amazed at how wonderful they taste – great served up as a treat with food too, especially salads. They add colour, interest and delight for dinner guests. You can eat the leaves too but only the young ones (older ones are too fibrous and not too many because in quantity they are reputed to have a hallucinogenic effect. PLEASE make sure you do have the correct flower before you attempt to eat it though!